Case history A 5-year-old girl presented with a suspected palatal abnormality, first observed by her general practitioner during a routine examination at 4 years. She had a history of conductive hearing loss on a background of recurrent otitis media, however her hearing had improved since grommet insertion at 4 years and 8 months. Her middle ear dysfunction was thought to be due to abnormal palatal muscles that also control Eustachian tube drainage. No difficulties with breast feeding or nasal regurgitation were reported. She was referred to a cleft specialist team to be assessed by a cleft surgeon, speech language therapist and ear, nose and throat specialist. On oral examination, she presented with a bifid uvula at rest (figure 1).1 2 An overt submucous cleft palate (SMCP) was confirmed through palpation and inspection of her palate during phonation of ‘ahh’ and ‘ah-haa’, which allowed for visualisation of soft palate elevation. Speech assessment revealed typical resonance (ie, no hypernasality) and no nasal air emission or turbulence, the presence of which may typically suggest an SMCP. The patient’s speech was ‘often hard to understand’ however, but this was due to delayed phonology (cognitive-linguistic speech sound processing).3 She also had impaired receptive (understanding) and expressive (talking) language skills on formal standardised language assessment (Clinical Evaluation of Language Fundamentals, Fourth Edition). 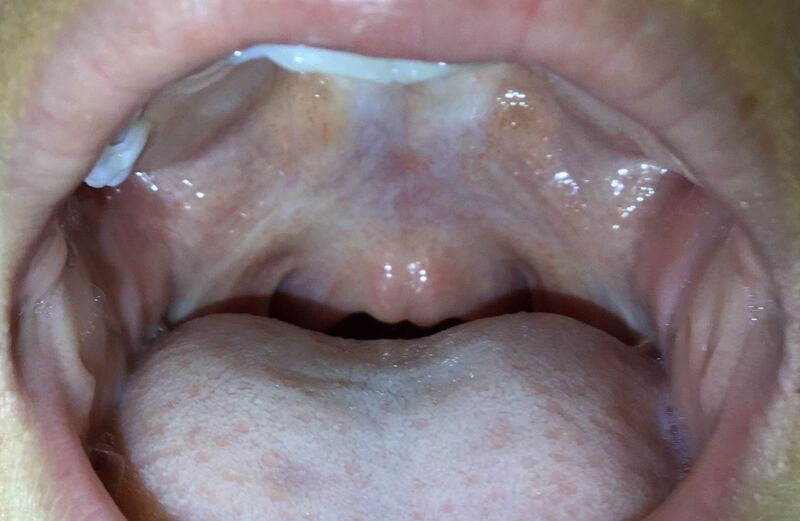 Surgical intervention was not indicated given the cleft was not functionally impacting her speech (ie, no velopharyngeal insufficiency (VPI)) or eating (ie, no nasal regurgitation during feeding). Surgery aims to improve velopharyngeal functioning by repositioning the levator veli palatini muscle. This child had adequate velopharyngeal functioning despite her striking anatomical presentation, and her speech difficulties were developmental (phonological impairment) rather than structural. Speech therapy is indicated for her delayed phonology and language deficits. VPI symptoms will be monitored for late onset as she continues to grow. This is particularly important as children with palatal anomalies have increased risk of developing VPI when their adenoids atrophy with age.4 5 She will also remain under the care of ear, nose and throat specialists and audiologists to monitor her hearing and middle ear dysfunction. What anatomical features indicate an overt SMCP? What features of communication would indicate VPI and possible surgical intervention? Contributors JOB took the photographs and drafted the manuscript, with support from NK, RPT and ATM. RPT diagnosed the submucous cleft palate. Funding This work was supported by a National Health and Medical Research Council (NHMRC) Practitioner Fellowship (1105008) and Centre of Research Excellence (CRE) in Speech and Language (SLANG) (1116976) awarded to ATM and Murdoch Children’s Research Institute Postgraduate Health Research Scholarship awarded to JOB. This work was also supported by the Victorian Government’s Operational Infrastructure Support Programme. Ethics approval Royal Children’s Hospital Melbourne Human Research Ethics Committee.